Russia has supplied Laos with four Yakovlev Yak-130 advanced jet trainers constructed at the Irkut Corporation’s plant in Irkutsk under a controversial deal, of which full details have yet to emerge. The aircraft arrived at the Vientiane air force station aboard Russian Il-76TD strategic airlifters in December 2018. They were assembled and flown earlier this year ahead of the Lao People's Armed Forces (LPAF)’s parade devoted to the 70th anniversary of its foundation. Following the withdrawal of MiG-21 fighters earlier this century, the LPAF air force has not operated any combat jets until the arrival of the Yak-130s. These statements were made after press reports insisting that the Yak-130s and an unknown number of T-72B1 main battle tanks were traded for 30 T-34 tanks of World War II vintage from LPAF stocks. The latter have arrived in Russia for intended use in military parades and for propaganda purposes. The respective agreement was reached a year ago during the official visit of the Russian defense minister, Sergei Shoigu, to the Lao People's Democratic Republic. Official sources confirm the receipt of T-34s but insist that Laos provided them free of charge. Laos becomes the fifth foreign customer for the Yak-130, following Algeria (16), Bangladesh (16), Myanmar (10), and Belarus (eight). Since 2009, the Russian Air and Space Force (VKS) has received more than 100, and deliveries continue. All of the Yak-130s built so far are configured as trainers with a secondary role of ground attack. With a gross weight of 10.3 tonnes, the aircraft can carry three tonnes of weapons on six underwing pylons, plus two R-73 air-to-air missiles on the wingtips, which otherwise can mount electronic warfare pods. 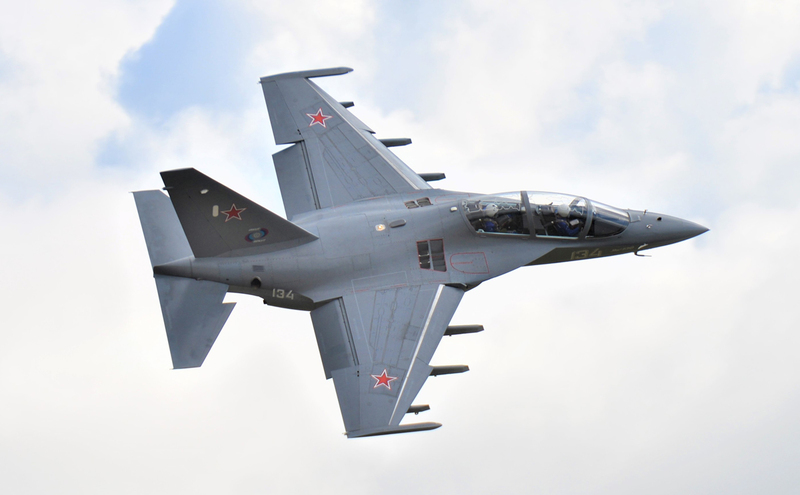 At MAKS’2015, Irkut exhibited a version—sometimes referred to as the Yak-130M—with enhanced air-to-air and ground strike capability that is intended for export. The aircraft presented at the show on static display was a development prototype (01) with an altered nosecone to house electro-optical equipment. According to a press statement by the manufacturer, this version was created as a response to calls from unnamed foreign customers who asked for more combat capability in the ground attack role. The Yak-130M has a laser rangefinder to measure distance to targets and an electro-optical suite for the targeting of both aerial and ground targets. The mission equipment gives pilots more accurate information about the targets being attacked. Using laser technologies allows the crew to perform more efficiently when attacking ground targets in hilly terrain. The statement insisted that the range of air-launched munitions remained the same. Industry sources, however, insisted that this version can deliver a newly developed 250 kg-class guided bomb. Earlier, the manufacturer considered an unmanned combat air vehicle based on the Yak-130 platform and a dedicated single-seat attack aircraft with a multi-mode radar and laser rangefinder-target illuminator but dropped them after no customers were found.